This has to be one of my absolute favorites. Black & White is always beautiful, now add handpainted fruits, on English Ironstone with that beautiful glaze. These silverware styled napkin rings were brass, so I spray painted them - 4 black and 4 white. So pretty! The runner is perfect with those beautiful plates. And the black and white candles are so creative, love the touch they add. Hi, Tammy! I can see why this is your favorite. The dishes are so pretty (that dinner plate is FABULOUS! ), and black & white is always such a hit! You simply cannot go wrong with black & white!!! The table seems to work really well with the artwork you have hanging in the room, too! I marvel at you...spray painting is something I shy away from because I'm always afraid of ruining an object. You have no fear, though, and your napkin rings rock! Thanks for stopping by my place last night. I'm slow about getting through all of the blogs today, but glad I was able to see your creation! Have a great weekend! Thank you for so nice and generous comments, I'm very grateful. Well, Diva...I'm crazy about this table! Your dinner plate is fantastic! I love it! A black and white table is always so dramatic and theatrical...and in this case, so, elegant! Your table and chairs are awesome! 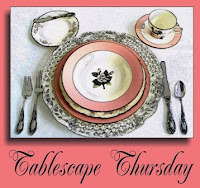 Oh I adore your tablescape~ swoon! Great table in black and white. This is a wonderful tabletop design.